WinWin wants to start a revolution, an American Business Revolution. 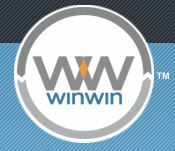 Driven by a simple, but innovative concept, and leveraging the right technology, WinWin created a thriving online community of businesses wanting to work together and grow. Founded in 2011, based in Long Island, New York, WinWin is a company driven by an inspired group of creative entrepreneurial personalities who truly believe that by connecting and collaborating, the business owners, executives and managers of the United States can reclaim their independence, drive business and find success and balance in their lives.